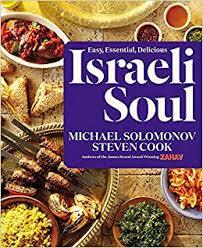 From the Phiadelphia chef who gave us a video on Israeli food, the Zahav restaurant, the NYC Dizengoff hummus bar, the ZAHAV cookbook and memoir of Philly and Israel, Federal Donuts, and more comes a new cookbook filled with the entrees that define Israeli cuisine. Of course there is tehina, hummus, falafel, roasted spice-rubbed meats, sabich, and various vegetable salads, but also broccoli and pine nut pesto. Raise your hand if you had his father for Chemistry at Hebrew University. From the author of the JERUSALEM cookbook and one of the best selling London-based Israeli chefs, Ottolenghi’s latest (and seventh) cookbook is titled SIMPLE, but it isn’t really so simple. To him, SIMPLE means (S)hort on time, fewer than 10 (I)ngredients, (M)ake ahead, (P)antry, (L)azy, and (E)easier than you think. He and his team present 130 Near East inspired recipes that his team has streamlined for the home cook. Each dish can be made in less than a half an hour using a . Highlights include Braised (not fried) Eggs with Leeks and Za’atar (Sumac); Cauliflower, Pomegranate, and Pistachio Salad; Lamb Meatballs; Fettuccine with spiced cherry tomato sauce, Chicken Marbella; Gigli with chickpeas and za’atar; and Fig and Thyme Clafoutis. Nik Sharma is the curator of the food blog, A BROWN TABLE, which he started in 2011 while working in DC as a medical researcher. He was inspired by David Lebovitz and Deb Perelman of Smitten Kitchen. He now is a food columnist for The SF Chronicle and resides in the Bay Area. His book features 100 recipes and techniques with nearly triple the number of photos, based on his personal journeys in Mumbai, the American South, and California, and relying on cumin, coriander, curry leaves, Kashmiri chile powder, cardamom, asafetida, and nigella seeds. There are NO curry recipes in the book, so don’t automatically think that since he is an immigrant from India, that it is all about curry. Most alluring is Apple Masala Chai Cake; spicy and sweet Chile-Sumac-Pomegranate Nuts; crispy roasted cauliflower salad with spiced lentils; sweet potato fries with a basil-yogurt dipping sauce; Goan-style mashed potato fried pancake “chops” with lamb; and curry leaf popcorn chicken. Here is his recipe for sweet potato bebinca based on his maternal grandmother’s Goan-style recipe. Julia grew up in a Jewish family on the secular side of observance, but now living up in rural High Falls, NY, she and her partner have a weekly Shabbat dinner with friends. I became familiar with Turshen from her eaarlier cookbook on feeding lots of people who attend protest rallies and resistance movement meetings (Feed the Resistance). In Now & Again, she shares over 125 (thrifty, leftover-based) recipes and twenty menu for shared meals and social gatherings. One of her menus is for a Rosh Hashanah dinner, another is for Passover. For Rosh Hashana, try her applesauce cake with honey cream cheese. She uses leaves of leftover herbs to make salsa for Herb Stem Salsa Verde: thinly minced herb stems, garlic cloves, Dijon mustard, red or white wine vinegar, olive oil. Her Shaved Celery + Parmesan Salad gets rid of leftover celery. Get rid of berries and fruit with pancakes. Make your own chile sauce with water, chiles, and distilled white vinegar. Peel and freeze overripe bananas. Add them to a blender for banana bread milkshakes. Addena Sussman, a newlywed, a new step-grandmother, and new Tel Aviv resident (she lived in Yerushalyim for half a decade in the 1990s), as well as the author of over ten cookbooks, got a call from fashion model Chrissy Teigen. Sussman had just finished up a book with chef David Burtka (husband of actor Neil Patrick-Harris) and was close to signing a deal for a project with an Israeli chef. Could Sussman live with Chrissy for a few months.. and cook? And so they cooked, they tested, they cooked and they wrote a new cookbook together. The motto of DELISH is that you don’t have to know how to cook, you just have to love to eat. I tis for people who love to eat more than the love to cook. In this cookbook they feature 275+ recipes for normal items like Grilled Cheese Dippers, Sloppy Joe Potato Skins, Lasagna Stuffed Peppers, Mint Chip Brownie Cups, Shark Attack Jell-o Shots, a Harry Potter–inspired butter beer pie, Boston cream pancakes, and Cookie Dough Cheesecake. Delish editorial director Joanna Saltz is also the editorial director for Hearst’s HouseBeautiful.com. The viola player is most famous, to me at least, for her Passover Matzagna – matza lasagna. The book is a tad too twenty something focused with hashtags that feel forced, but if you ignore them, you will enjoy the recipes. In her new cookbook, Cook Like a Pro, Ina Garten shares a brand-new collection of recipes, tips, and techniques, so readers can cook with confidence no matter how much experience they have in the kitchen. Highlights and secrets include her custardy, slow-cooked Truffled Scrambled Eggs; Juicy Fried Chicken Sandwiches; patterned Chocolate Chevron Cake; and Raspberry Baked Alaska. Since opening in downtown Los Angeles in 2012, Bestia has captivated diners with its bold, flavor-forward food served in a festive, communal atmosphere. With roots in Italian regional cooking, the recipes are not very kosher, but can be adapted for tomato, greens, and preserved lemon; agnolotti made with cacao pasta dough; breads; pastas, and more. I learned that to make a pizza at home YOU — USE THE BROILER for the final step. Ori Menashe and Genevieve Gergis were both born in Southern California, but Ori moved to Israel with his family as a child. His parents, of Moroccan, Georgian and Turkish heritage sold their tow clothing stores and moved to Israel. Ori, like many israelis, visited South America for his post Army walkabout, and – cooking for his buddies in Argentina – he realized his passion for cooking. At 21, he returned to LA from South America and enrolled in culinary school, finding his first food-related job at an Israeli cafe, and then went to La Terza, where Gergis was a hostess. In 2010, the two opened Bestia together – a true husband and wife restaurant. Within 3 years, the late Jonathan Gold gave them much praise. By the way, Ori has these lessons for creativity management: Embrace Creativity. Be Willing to Adapt when circumstances change. Challenge yourself, feel insecure, feel frustration. Mistakes will happen if you take risks. So accept them and learn from them..Add cinnamon to a tomato salad. Encourage Dreamers. Analyze all touch points with the customer. Improve them. Valet parking is part of the whole restaurant experience.